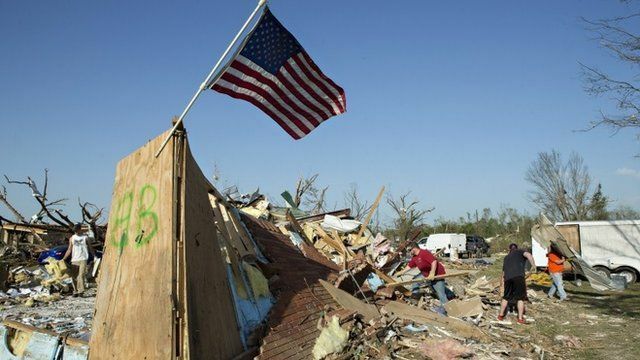 US storm chaser on tornado devastation Jump to media player Deadly storms are again barrelling down on the southern US, a night after tornadoes claimed 16 lives. Drone captures US tornado destruction Jump to media player Footage captured by a drone shows the devastation left by a tornado that struck a highway south of Mayflower, Arkansas. Deadly tornadoes hit US states Jump to media player Several people are reported killed by tornadoes as a huge storm system sweeps across the central and southern United States. Drones may soon assist with tornadoes Jump to media player Scientists in Oklahoma are working on implementing new technologies to study tornadoes, and to assist in search and rescue efforts in the aftermath of a tornado hit. Deadly storms are again barrelling down on the southern US, a night after tornadoes claimed 16 lives. Seven deaths were reported in Alabama and one in Mississippi after twisters struck on Monday evening, although not all these fatalities were confirmed. Matt Coker, a storm chaser, told the BBC that he was tracking the tornado yesterday when it hit the town of Mayflower in Arkansas.